AMD has announced a new lineup of graphics cards and, before you start shouting “Vega is finally here,” you should know it’s a new set of Polaris GPUs. At the top of the new Polaris 500 family is the AMD Radeon RX 580, featuring 32 compute units and and 8GB of GDDR5 video memory. Speed-wise, the RX 580 hits a 1,257MHz base clock speed accelerating to a 1,340MHz boost. Engineered as a direct Nvidia GTX 1060 competitor, this new flagship GPU promises deliver well above 60 frames per second (fps) gaming on 1,440p and Ultra settings – as well as seamless virtual reality experiences. Priced at $229 (about £180, AU$300) for the 8GB version and $199 (about £160, AU$260) for 4GB, AMD is making a sweeping claim that it will 12% faster than any older $200-$300 GPU when it releases on April 18th. Just a step under is the Radeon RX 570, which AMD claims will deliver maximum Full HD gaming. It comes with four fewer compute units than the RX 580 and 4GB of GDDR5 VRAM, but you’ll be able to hit 1,168MHz and 1,244MHz base and boost clock speeds, respectively. Down another peg, the AMD Radeon 560 aims itself at the eSports gaming crowd. According to AMD, you should expect smooth 60 fps FHD (1080p) gaming on DOTA 2, CS:GO and Overwatch. This comes thanks to the RX 560’s 16 compute units and 4GB GDDR5 VRAM serving up a 1,175MHz base clock and 1,275MHz boost frequency. Last but not least, AMD is introducing the Radeon RX 550 as a new GPU class. 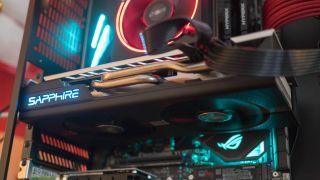 Outfitted with only 2GB of GDDR5 VRAM and 8 compute units, this graphics card won’t be setting any GPU frequency records with its 1,183 boost clock, but may be ideal for streaming and 4K video playback. And, it’s not designed for that – rather AMD explains it’s introducing the RX 550 as a discrete graphics option for those putting together compact, fan-less systems – i.e. home theater PCs. Here's the pricing and availability below, though, keep in mind AMD has set a suggested price from which custom board makers are adding and subtracting to. The chip maker's latest Polaris 500 graphics cards come built on a refined, 3rd generation 14nm finfet architecture. As you might expect, the new platform pushes stronger performance with more aggressive tuning for higher clocks plus enhanced efficiency while idling (i.e. sitting on the desktop) and on multi-monitor setups. Beyond the obvious performance increases Polaris 500 brings over from its predecessors, there are plenty of other technological benefits. Radeon Chill, for instance, helps lower energy consumption and GPU temperatures. The RX 570 sees the greatest benefit with Radeon Chill reducing GPU power usage by 43% while running 20-degrees cooler Celsius. Livestreamers will also benefit from a new dedicated encoding block designed to take stress off the GPU. Radeon 500 is also equipped to support the coming world of 4K HDR media. With AMD Vega on the tip of gamers' tongues everywhere, an AMD spokesperson explained that it’s not going to hold back on the progression of its technology for anything that may come down the line. It’s a valid statement, however, that doesn’t lessen our curiosity as to when Vega will be unveiled in full. It's also seemingly odd that the latest, greatest AMD graphics card is being sized up against Nvidia's mid-range GPU of last summer.